Not getting the email results you want? Make sure you’re following these 7 email marketing guidelines. There’s not a person reading this whose firm isn’t doing some sort of email marketing. And you should… even with all of the technological changes taking place in the world of marketing & sales, good ol’ email continues to be one of the most effective and cost-effective ways to generate leads and then nurture them over time. 1. Provide value… don’t sell. There are a few emails that I receive every day. Yes… every day! And you know what? I look forward to receiving them. Why? Because they provide content that’s interesting or useful to me. You need to be doing the same. Stop selling. Inform and educate, instead. Help solve your readers’ problems. Use email to position your firm as a thought-leader and showcase your expertise. THAT is what will lead to new business opportunities. 2. Get them to your website. I receive emails – from a couple of research firms – that seem to go on forever. I have to keep scrolling and scrolling and scrolling. For one, that’s just not a reader-friendly email. More importantly, though, if you embed a full article in an email – and even if it’s a good article – you’re not pushing them to your website… which you ALWAYS want to do. Use the email to ‘tease’ them about the article, then have a button that says, ‘To read the complete article, Click Here.’ On your site, they can finish the article, learn about what you do, access other resources, etc. Provides a list of WHO did what, for tracking and follow-up. Monitoring metrics teaches you how well your email marketing is performing, what content topics interest readers and helps you to fine-tune the process with A/B testing (which kinds of subject lines work best, which day of the week gets the best results, which layout is most effective, etc.). The goal? Continuous improvement. 4. Don’t be spammy! If you haven’t done business with the people in your database, swapped business cards with them at some point or if they didn’t download one of your white papers… then they shouldn’t be there. Also, just because they connected with you on LinkedIn doesn’t mean they want to be on your email list. And please don’t ‘scrape’ online directories and drop emails in your database. Finally, if someone wants to opt-out, make it easy for them. Check out the CAN-SPAM rules if you’re not sure what to do. 5. Be consistent. Like I mentioned earlier, some emails I receive daily… some weekly and some monthly. It doesn’t matter what frequency you commit to… you have to stick to it. This means editorial calendars and a production schedule. By the way, your inability to stick to something easy – like a regular email schedule – might leave an impression with your clients that your project management skills aren’t very good… not what you want them thinking. 6. Integrate the look and feel. When a recipient receives one of your emails, there should be no doubt that it comes from your firm. The look and feel of the email should be very consistent with your website, blog and other marketing communications. This is not the time to try something new… in fact, it’s a great opportunity to reinforce your brand in the marketplace. 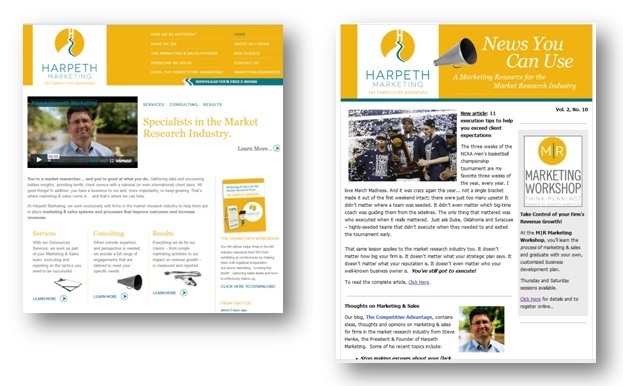 As an example, below is the home page of the Harpeth Marketing website (left) and a recent email sample (right). They don’t have to be exact duplicates… but there should be very strong consistency in the design and the tone of the writing. Get rid of bad email addresses. The bounce-back list you receive after each email blast is a good resource for this. For each ‘hard bounce’ (a permanent error), remove that email address. Also, pay attention to your LinkedIn email notices about people changing jobs. Use that information to keep your email database up-to-date. Segment your list. I am amazed at the databases I see where everyone is just lumped in together… clients, prospects, vendors and even competitors. Take the time to segment them into the appropriate groups. You might even want to consider dividing the clients and prospects further – into the industries they’re in. 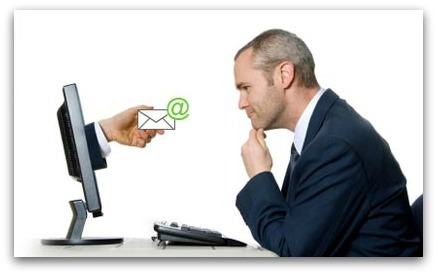 You do all of this for two reasons – to make sure that only the people you want to receive your email receive it (i.e. no competitors) and to be able to target mailings (e.g. only to clients or only to those in the automotive industry) if you choose to. Bottom line: Email marketing is going to be with us for the foreseeable future… so make it part of your arsenal and make sure to do it right by following the email marketing guidelines above. Your results will be worth the effort. FREE DOWNLOAD: To download a free spreadsheet for tracking and reporting your email activities, Click Here (no email address required).